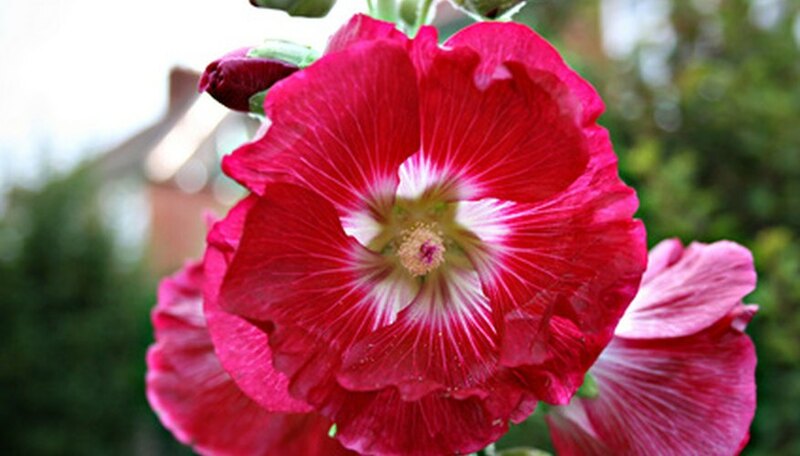 Hollyhock is a late spring and early summer blooming perennial enjoyed for its large, bright flowers. Of the approximately 60 different species of hollyhocks (Alcea rosea), flower colors are found in red, purple, pink, yellow and white. Some species grow to 8 feet in height. This drought-resistant plant is low-maintenance, growing best in hardiness plant zones 4 through 10 in full sunshine. Plant year-old hollyhock plants from the nursery or garden center in early spring. Make sure the last cold frost, in your location, has passed. You can plant these perennials by seed, but they will not flower the first year. Dig a hole deep enough to accommodate the original pot size. Mix a handful of compost into the soil at the bottom to add nutrients and to improve water drainage. Remove the hollyhock plant from the container. Place it in the hole. Mix the soil you dug from the hole with another handful of compost. Pour the soil mixture around the original roots and soil, packing it down gently with your fingers. You are finished when the soil is even with the top of the original potted soil. Water the plants, until the soil is soaked, right after planting. Although hollyhocks are drought-resistant, they enjoy a consistent watering schedule, a couple of times a week. If your weather becomes exceedingly hot and dry, add another watering to the weekly schedule. As winter appears, water these perennials once a week at the most. When the plant is in its dormant stage, it requires less moisture. Winter precipitation will offer all the moisture the hollyhock needs. Fertilize the hollyhock plant two times per year, once in the early spring as it begins the growing cycle, and again in the fall to sustain it through the winter. Use a balanced fertilizer, such as 10-10-10 or 15-15-15. These are the numbers on the front of the fertilizer container, referring to the percentage of nitrogen, phosphorus and potassium in that order. Prune the brown or yellowing leaves off the plant as they appear. Pinch off the spent blooms as they die. This will let the hollyhock plant draw more nutrients to growth and blooms. It will also cause blooms to grow more abundantly and lessen the seed production. Cut the plant to nearly ground level in the fall, if you notice hollyhock rust. This is a fungal disease causing yellow and brown spots on the stems and leaves and is the primary disease problem for this plant. Burn the cut leaves and branches to destroy the fungus. The new leaves that arrive the next spring should be disease-free. Start a fungicide treatment the next spring. If it resurfaces, repeat the process.